The Hobbit, The Enchanting Prelude to "The Lord of the Rings"
The Hobbit: The Enchanting Prelude to "The Lord of the Rings"
The Hobbit (The Authorized Edition): The Enchanting Prelude to "The Lord of the Rings"
This is an unabridged version of the Tolkien classic masterfully narrated by Rob Inglis. 9/10/2010 Joseph Beekman said: Classic! Enduring and beautifully imaginative and always a fun adventure story! 4/16/2010 Kate Russell said: One of my all time favourites. If you haven't read it, do so before the movie comes out! The prequel to the Lord of the Rings (which I also love - and I think Peter Jackson did a brilliant job on the movie trilogy), but it's a much lighter read with a lot of humour in it. 11/3/2009 Kieran Crowley said: I read this every five years and it always takes me back to 1981 when I first got my hands on it. 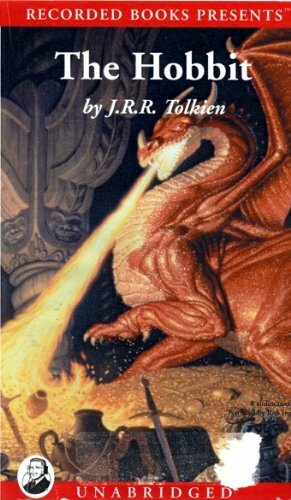 At the time I'd never read anything like it and although everyone else seems to prefer The Lord of the Rings, this is the one that inspired me. 3/5/2009 Dawn Schenk said: "It is not like you, Bilbo, to keep friends waiting on the mat, and then open the door like a pop-gun. This is what started it all for the books that followed. Add your reply to Julie S.